You’ve potted plants and stocked up on propane, but there’s one more step before you start emailing invites for your first backyard barbecue of the season: getting patio furniture ready for guests to enjoy. Even the most soiled fabrics and furniture can look new again after some tender loving care. So before you drop hundreds of dollars on new tables, umbrellas, chairs, cushions, and covers, try a small bottle of specialty cleaning solution and protectant instead—just as Martha Stewart recommends. You may want to put down a drop cloth underneath the item being treated to catch any overspray. 1. Vacuum, shake off or brush away loose debris, then hose down to rinse any remaining dirt. 2. Use a high-quality cleaner, such as 303® Multi-Surface Cleaner, to safely eliminate any stubborn stains caused by bird droppings, oil, grease, smoke and tree sap. For furniture, spray and wipe dry. For fabrics, use a soft bristle brush, sponge or cloth to apply cleaning solution mixed with lukewarm water. 3. Rinse thoroughly (and repeat, if necessary) to remove all loosened soils as well as cleaner residue. 4. Allow object to dry completely. 5. For furniture, move out of direct sun and spray surface with 303 Aerospace Protectant and wipe completely dry. This product does not air dry. Extra buffing with a dry cloth increases bonding, repellency & longevity. For fabrics, move into direct sun (to promote curing) and spray surface until evenly wet with 303 Fabric Guard, overlapping sprayed areas. Outdoor living is supposed to be stress-free and fun. The backyard isn’t a place where you want to be worrying about red wine stains or stressing over blobs of sunscreen. Once furniture and fabrics are completely clean and dry, use a spray protectant to repel dust, dirt, soiling, and stains. A good product will prevent fading and mildew and doesn’t need to be reapplied more than once every 60 days. The best part? Our high-quality fabric guard virtually eliminates the need for costly covers in mild climates. In fact, 303 is the only treatment recommended by Sunbrella®. Consider this story from our friends at OW Lee. Recently, the company was inspecting one of its client’s custom-made patio furniture. 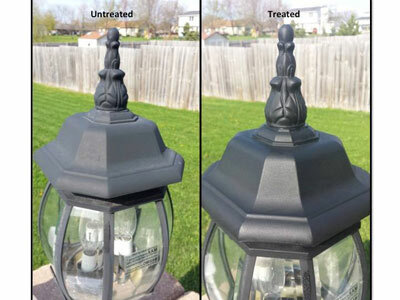 Powder-coated wrought iron had been damaged by years of sun exposure, yard sprinklers, and rain—seemingly beyond repair. Even after cleaning off calcium buildup the table and chairs looked dull, lifeless and old. The furniture was seven years old when that picture was taken! The only potential problem? Your dinner guests may never want to leave. Awesome tips shared by your blog which are quite helpful for cleaning furniture. Quite helpful article. Awesome information shared by your blog. 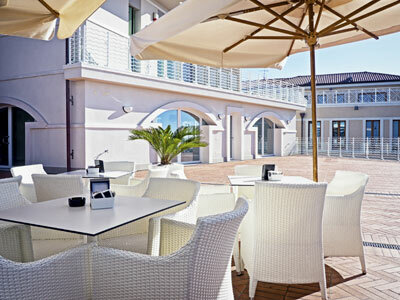 This article is quite useful for cleaning outdoor furniture. Amazing tips shared by this article. This is a great read and some very relevant tips. Very well written article with complete description on best tips of furniture and outdoor fabric which are different in their own ways. Keep update more tips. I really appreciate your tip to regularly remove any loose dirt or grime from your outdoor furniture. My wife and I have been thinking of getting a new house, and we want to make sure that we can entertain any guests that we might have over with a large outdoor back patio. If we do get that patio, I will be sure to check the furniture that we would get for any dirt or grime!